Tough and weather resistant, the Rubbermaid 1192 Action Packer is a great option for those looking for a reliable storage solution. Combining strength with versatility, this 48 gallon Action Packer can be used both indoors and outdoors. 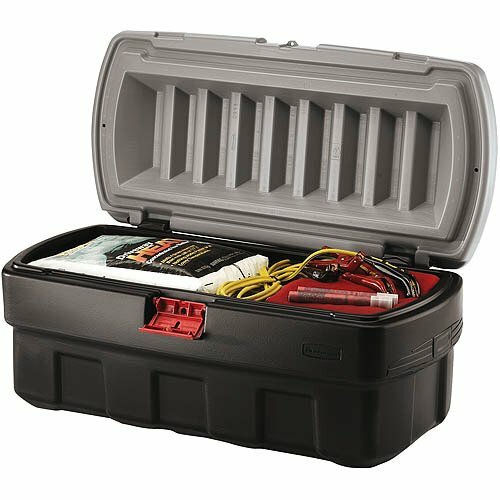 You can store tools, garden equipment, and other stuff safely in this storage box as it comes with a lockable latch. As it offers protection from moisture and dust, you can keep this plastic tool box in your basement or backyard. You don't have to worry about the contents getting damaged due to rain when you are storing stuff in them outdoors as this box comes with a waterproof exterior. The box has a grooved frame that makes it easy for you to secure it to truck, boat, or car using bungee cords. Make the maximum use of space by stacking these boxes one above the other. This tool box comes with a handle for easy carrying.